The RAFT (Reversible Addition-Fragmentation Chain Transfer) process greatly enhances the control over radical polymerisations, while leaving behind a thiocarbonylthio end-group. Thermolysis presents a convenient and efficient way of removing the thiocarbonylthio end-group from RAFT polymers, without the use of additional reagents. 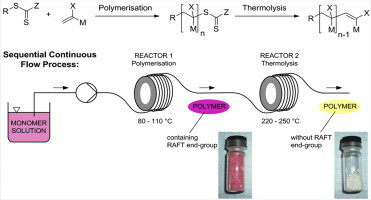 This paper describes a simple two-step flow process for the synthesis of RAFT polymers followed by the subsequent removal of the RAFT end-group via thermolysis, without the need for isolating intermediates. A range of different polymers based on styrene, acrylates, methacrylates and acrylamides were synthesised with different RAFT agents and successfully tested for thermolysis at temperatures between 220 and 250 °C in a stainless steel tube flow reactor, resulting in complete removal of thiocarbonylthio end-groups.